It is one of the most remarkable pieces of legislation of its time. With the official title of “An Act to create the Office of Surveyor-General of the Public Lands in Oregon, and to provide for the Survey, and to make Donations to Settlers of the said Public Lands,”1 it’s more commonly known simply as the Donation Lands Act. And it changed the face of what became Oregon forever. Yeah, you’re right: The Legal Genealogist heads west at the end of the week, and so will be looking at laws and resources in Oregon (April 22: Bend Genealogical Society), Washington (April 28-29: Tacoma-Pierce Genealogical Society) and California (May 6: Root Cellar Sacramento Genealogical Society). And there isn’t much that shaped the Pacific Northwest more than the Donation Lands Act. 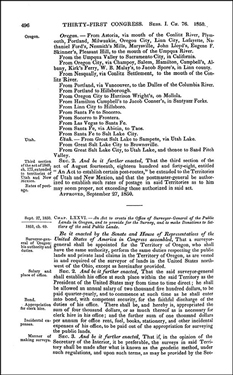 A federal law, it became law on 27 September 1850, and it caused a major land rush — and validated an earlier one. A single man, under the provisional land grants, could get one half section, 320 acres. But here’s the amazing part — the part that really made this one of the most remarkable pieces of legislation of its time. This, at a time when, in most of the country, married women still had very little right to own and control property. • Notification of settlement, which describes the land either by legal description (township, range, section and fraction of section) or by natural features (metes and bounds), sometimes accompanied by a plat. • Affidavit of settlement, which includes date and place of birth and, if applicable, of marriage as well as proofs of cultivation. • Oath that the land had been used for cultivation only. • Proof of citizenship for naturalized persons. Best of all, there’s an index to all 7,373 indexed claims online at the website of the Genealogical Forum of Oregon. Benefits to women… detriments to Native populations. A double-edged sword for sure. And one that, for genealogists, leaves a treasure trove of documents. Thank you! This is interesting to me as a member of my family, who was born and lived in Georgia, chose to settle in Oregon. Francis “Frank” Bayless (1856-1924) along with his wife Elizabeth, traveled to Hepner and settled there. Elizabeth died sometime after they arrived in Oregon and Frank remarried. I have often wondered what propted Frank to go there. I don’t know when he went nor why but I suspect he saw the land advertised in the paper and took a chance that led to his spending the rest of his life in Oregon until he died at the home of a family member in Washington. The information in this article is helpful in enlightening me as to why he might have gone there. Frank came from a large family yet none of them went with him. His Mother and sibs went to Texas.